This is the tenth installment of: “Keep a 5 year Journal.” At midmonth, Tami shares her progress and the list of questions for the upcoming month. Click here to see all 12 months. We are closing in on the first year of our 5 Year Journal. How are you doing? Are you excited that next year we are going to be able to compare answers between years? I know it’s a long haul but you should take a moment to celebrate this victory. As we are coming up to the end of the first year do you have any words of advice for anyone just joining the 5 Year Journal journey? Share your thoughts and experiences in the comment section. I only recently discovered your site and the 5 year journal concept. I COULD NOT wait until January to start so my year started on October 1. I have tried to keep journals or diaries in the past and never stuck to it. This is so much easier, I keep my journal on my bed and answer the daily question each night before I go to sleep. I am very excited about this endeavor. good job Roberta, it will be a nice treasure to keep. Tami, I really believe that for future generations these pages of questions and my answers are more meaningful than most any other pages I do. They also spark ideas for layouts. Thank you so much. What an incredible resource you have created and are creating here. I hope you continue to do this for all 5 years. I have printed out and saved each of the months of prompts. I have been a journalkeeper for 30 years and have done it all. However, what you have complied, and are compiling, is one of the best I’ve seen. Well done. Additionally, I write fiction novels. Each of these prompts are helpful for my writing. Thank you. Have a blessed day. Keep journaling and creating! In trying to decide on a project for next year I just learned about the five year journal. I am so excited about this cause it seems simple so I might actually accomplish it. I’m going to begin on 1/1/2013, so I need to decide where to journal. I learned about this 5 year journal plan on Pinterest and got hooked. I look forward to each day to answer another question and journal about it. I try to stay on task and not move ahead even though I want to move backwards to write in things I can answer because of my planner notes. My memory isn’t that reliable so I need help where I can get it. I hunger for December’s questions. I’m soooo excited to start this in January! Thank you so much for this! I can’t wait till you put December’s questions out! Hi, I’m wondering what you did with the end of the paper on the other side of the note card? Thanks! is it ok with you if i start a new blog based on your questions? ill be sure to put up a link to your site for every post related to your questions. Is December up yet? Just wanted to make sure I haven’t overlooked it. 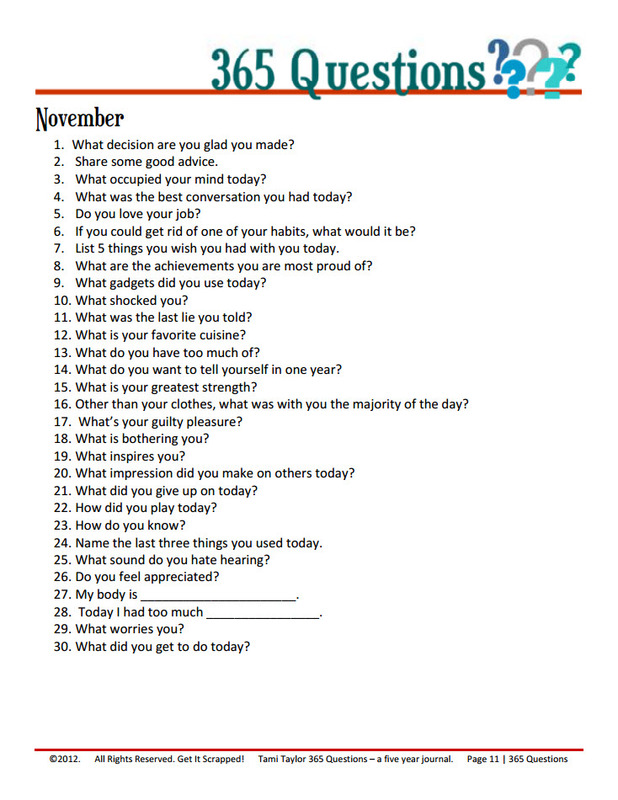 I’m hoping to find a way to make journals with these questions for some friends for Christmas. Thanks. Hi, Jennifer, it’s up now. SOrry about the delay. So really I JUST found out about this through pinterest and I am SO going to do this in 2013! I am already thinking of how to handle this, what’s a good way for me, cards or a journal or or or. I would also like to incorporate 1 line about the day itself, and 1 thing I am grateful for so I hope to find a big fat journal of I need a whole lot of cards!! I just found your site through Pinterest and am interested and ready to start the 5 year journal. Can’t wait to start the beginning of the year. I am also looking forward to December’s questions. Keep up the good work!! So it is now 2015, soon to be 2016. My question is: will there be new questions when the first 5 years is up? Hi, Roberta — so in 2017? Great questions. I’m not sure! I’ll have to see if Tami has the interest and will to do another round.